I’m constantly inspired by historical periods such as Art Nouveau and enjoy every opportunity to infuse some of the past into modern lettering. Click here to learn more. I officially started Katie Made That in March of 2017 after working as an art director at a small ad agency for several years. I was eager to go out on my own and start honing in on my style and niche as a graphic designer. 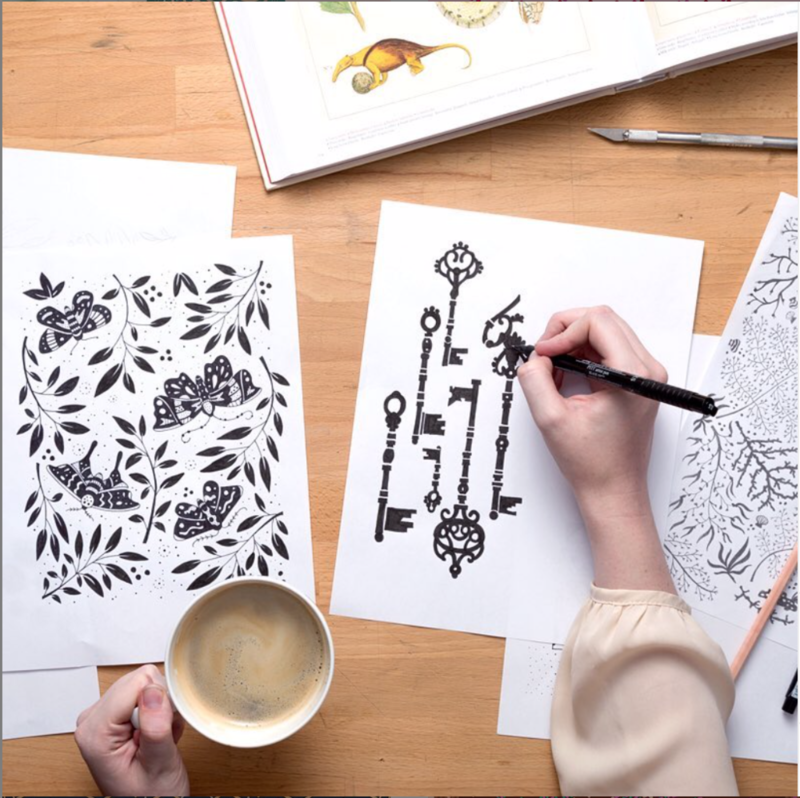 Katie Made That started as an online shop devoted to patterned art prints and greeting cards. 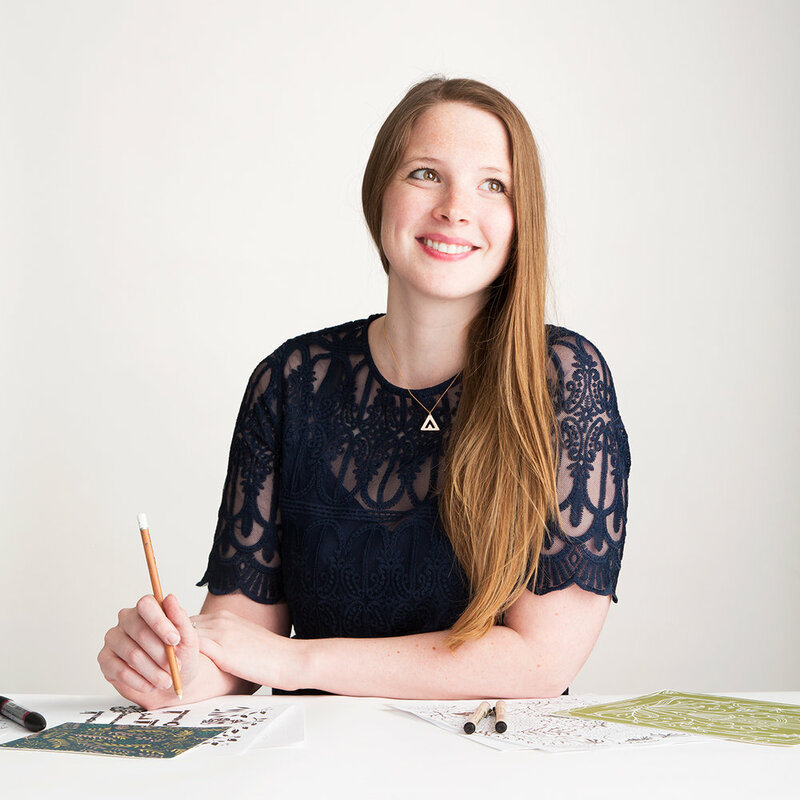 It has evolved a lot since then into a hand-lettering focused shop and freelance studio. Currently, the business is just me (and occasionally my husband, who lends a hand with packing and shipping and is the general hype man who keeps me sane). I work out of my home studio and sell goods online and in local markets. I do a lot of my design work solo. The collaboration aspect comes in when I need help with production of products! If I'm looking to print something complicated or bigger than I'm able to at home, I'll reach out to print shops for help and guidance. I've worked with several great screen printing shops in Austin like 4Lyfe Print Shop, Industry Print Shop, and Fine Southern Gentlemen. That's a hard one. Since my whole business is run by me, I do a little bit of everything. I try to make sure I create something every day, even if I have a lot of emails to attend to, or need to devote most of my time to something logistical, because the creative stuff is what I truly love. I do enjoy dipping my toes in things like marketing, and I like getting to decide the directions my business will take. But it's important to outsource the things that I really despise or just don't know enough about, like income tax. I should honestly outsource more tasks, and will try to do that as I keep growing! I love listening to podcasts about creative entrepreneurship like Being Boss, Creative Biz Rebellion, After the Jump, Proof to Product, etc... I also do a ton of research online and through books. I could really use a business advisor or coach, and initially was looking at the beginning of the year. But I felt unsure and overwhelmed by all the info out there, and it's a really big investment...so I could definitely use more help and guidance around finding the right person/people who can help me focus specifically on growing and refining my business. I'm a pretty sensitive person, and I'm notoriously hard on myself, so this has been a difficult area for me! Stepping out on my own and being totally in charge of what happens to my business has been super challenging, and I've been seeing a therapist for about a year and a half to try to learn how to better handle that stress. She has definitely helped me become aware of the way I talk to myself in my head, and how unhealthy I've been in my own expectations of myself. While I'm far from through with growing in this area, I've definitely learned that viewing anything as a "failure" is not really helpful. It's all about trial and error, learning from things that haven't worked, and then moving on with that knowledge as fuel for the future. My audience is typically women who are creative and who really value craftsmanship over mass market, generic products. Craft fairs and Etsy are a great place to get in front of those people and connect! For my greeting cards, for example, I do absolutely everything myself in my studio. I design the card on my iPad by hand-drawing with my Apple Pencil. Then I tweak and refine in Photoshop and print the cards myself and adjust until I get the colors I'm looking for. I trim the cards, score and fold them, and pack them all by hand! A good leader is someone who listens—to themselves and to others. A good leader knows what they should tackle themselves, but more importantly, what they should delegate. They know how important it is to give up control sometimes. I think I just wish I knew there were so many people out there doing what I was doing! I've realized that over time, but at first I felt a bit alone when I really wasn't. Would you like to meet Katie in-person? Come out to craftHER Market on April 14, 2019 at Fair Market and stop by her booth. Click here to learn more.